Michael Anthony are delighted to present to the market this two bedroom flat located in Great Linford. The property has been well maintained, is modern throughout and can be offered part or unfurnished, the landlord is flexible. There is a spacious lounge which gives access to the balcony with views of the canal. The fitted kitchen comes with white goods, and the bathroom has a shower over bath, heated towel rail, plus storage. There are also two double bedrooms with wardrobes in both. Other benefits include gas central heating and off road parking. Available to move into from March, viewings are highly recommended, so call Michael Anthony today for more information or to book your appointment! This property is marketed by Michael Anthony, Milton Keynes - Lettings at £750 per month. Rightmove has calculated the price per week for comparison purposes only. Property reference P54178. The information displayed about this property comprises a property advertisement. Rightmove.co.uk makes no warranty as to the accuracy or completeness of the advertisement or any linked or associated information, and Rightmove has no control over the content. This property advertisement does not constitute property particulars. 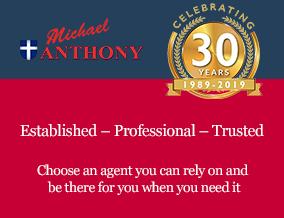 The information is provided and maintained by Michael Anthony, Milton Keynes - Lettings.